Pazyryk, the oldest Persian carpet which is named after the location of its discovery, is kept in Hermitage Museum of Russia. According to a Farsi report by YJC, a room in Hermitage Museum, one of the world’s largest museums of art and human culture, is decorated with the most ancient carpet of Iran and the world. This rug was discovered underneath frozen areas of “Pazyryk” near Russia’s border with Mongolia by Sergei Rudenko, a prominent Russian archaeologist, in 1949. 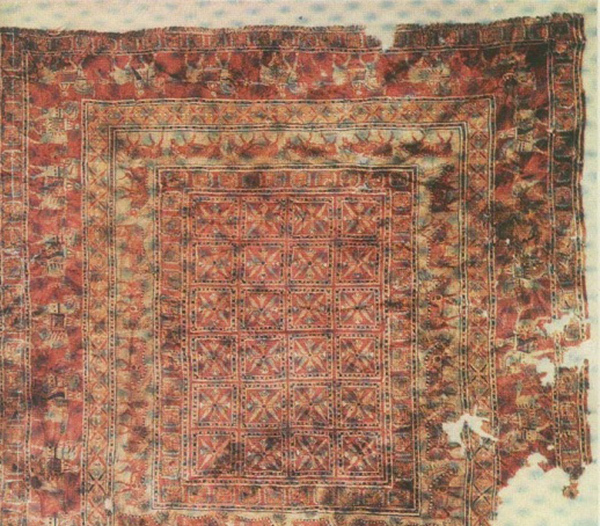 Pazyryk carpet was found in burial chariot of a Scythian nobleman beside his mummified body. Experts believe that this carpet, which dates back to the 5th century BC based on radiocarbon testing, had been used as horse cover and is a product of the contemporary Achaemenids. This carpet is 183 by 200 centimetres (72 by 79 inches) and has 36 symmetrical knots per cm² (232 per inch²). The design of the carpet already shows the basic arrangement of what was to become the standard oriental carpet design: A field with repeating patterns, framed by a main border in elaborate design, and several secondary borders. Its fine weaving and elaborate pictorial design hint at an advanced state of the art of carpet weaving at the time of its production. 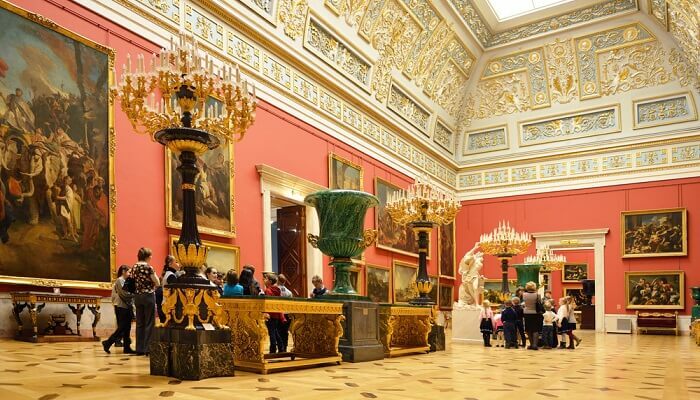 In Hermitage Museum, which is located in Saint Petersburg, Russia, more than 3 million excellent items are publicly displayed in six building. The main building- the Winter Palace- has been the residence of Tsars. The luxurious palaces and rooms of museum have been designed by well-known architects in different periods. Hermitage Museum contains the largest collection of ancient gold pieces of Eastern Europe and western Asia, as well as several other collections for medallions, cloths and royal jewellery. The collection of paintings comprises the artworks of great artists such as Leonardo da Vinci, Michelangelo, Vincent van Gogh and Pablo Picasso. There is also an important collection of inscriptions, epigraphs, small sculptures and applied art of Sumerian culture and civilization, founders of the Mesopotamian civilization, and ancient Mediterranean people. Iranian ancient artworks can be found there.